It was 27 February 2009 and we were due to fly to Bangkok from Singapore the next day. Khun Mae was at the home of a Thai devotee who had been staying in Singapore for many years. We were all about to leave when there was a distress call from a lady who is a follower of Khun Mae’s follower. This lady wanted to see Khun Mae as she was referred by her mentor who is one of Khun Mae’s followers. But she was delayed because she keep getting lost and could not find the place. Eventually, she found the place and came with her sister to come and ask Khun Mae for some guidance. At first, she came to ask Khun Mae for suggestions on how to improve her business. She was initially told by someone else that her business was not doing well because she had prayed to a deity and did not give thanks. The lady could not remember which deity and wanted to check with Khun Mae. Khun Mae advised her that it had nothing to do with praying and later not offering thanks to a deity. According to Khun Mae, it was related to her relationship with her mom. We have been taught by Khun Mae that it very important to talk nicely and be filial to our parents. Sometimes, we are not aware if we may have hurt our parents through our words and deeds as there is a generation gap and misunderstanding could occurr. If we cause sadness to them, we need to ask for forgiveness. If not, our lives would be laden with obstacles and we would not be able to find help and support in whatever we do. The girl, upon hearing it, broke down and cried- she told Khun Mae that actually, her mom is in the hospital and just recovering from an operation to remove her cancer cells and at the same time having failing kidneys and digestive problems. Khun Mae said suddenly, “your mom has been a very devotional person- always going to temples, praying and offering dana. I would like to go there and see her tomorrow.” The fact is, it was the first time we have met the lady- and no one told Khun Mae about her mom. I later checked with the lady and she confirmed her mom goes to temple to pray, pay respects and make donations. Our flight was about 11am in the morning. That means we had to be in Changi airport by 9am. And we have lots of luggage that have not been packed as Khun Mere was too busy being invited to different homes. Khun Mae made arrangements for the lady to pick us up at 6am the following day to visit the hospital. 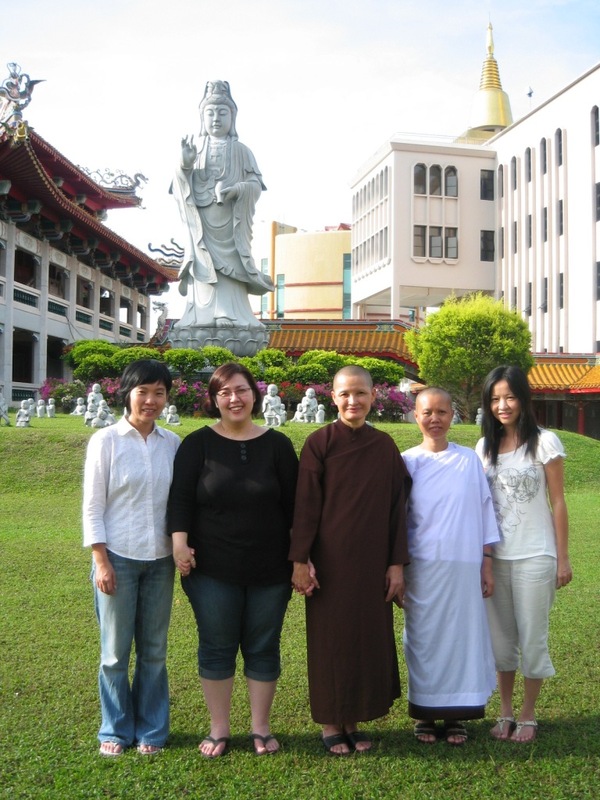 There were five of us- the lady, her sister, Khun Mae, Mae Chi Baibun and me. Khun Mae had also planned for the others to go to airport and meet her there. Upon arrival at the hospital, Khun Mae held the mother’s hands- and talked to her compassionately. The mother had been very unwell and had refused to eat anything. Khun Mae gently coaxed her to drink a cup of milo, which the mother did and it surprised her daughters because they had not been able to get their mom to eat since the operation. After the visit, Khun Mae told the ladies that she wanted all to go to Kong Meng San. There, Khun Mae requested the girls to buy some flowers and candles and circulate the Buddha clockwise for 9 times followed by short chanting and meditation. Khun Mae taught that there is significance in paying respect to the Buddha. After that, we went to the airport and took the flight back to Bangkok. The girls mentioned that prior to this, they never knew how to pay respect to Buddha and they took on to their knowledge with faith and conviction. Khun Mae told me that currently the mother’s health had improved despite the doctor’s initial pessimistic prognosis. Does a donor who donate through someone gets the merit?